Last edited by bh-dan; 02-18-2015 at 06:03 PM. To win a battle, you must earn at least one of the three possible Battle Stars. Depending on the base you are fighting, you may find it easier to destroy just the Castle, or, if the Castle is too well defended, you might instead try to destroy enough other buildings to reach 50% damage. Note that you can still earn Mana and Wood from a battle even if you do not win any stars. If you are low on resources, you might want to attack a settlement just to gain more Mana and Wood, even if you cannot "win". When you attack a Multiplayer rival, you also win or lose Trophies depending on the outcome of the battle. Study this info before attacking! If the attacker wins, they gain up to the number of Trophies shown on this display. 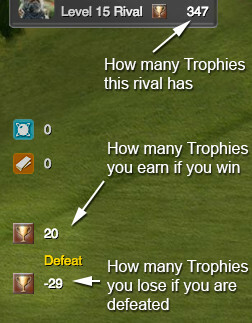 The greater the Base Damage, the more Trophies are earned. It takes 100% Base Damage to earn the maximum Trophies. If the attacker loses, they sacrifice up to the number of Trophies shown under "Defeat". 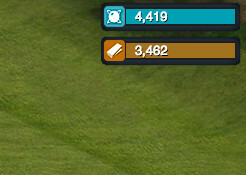 The more units were deployed during the attack, the more Trophies are lost. At least 1 Trophy is lost even if no units were deployed. 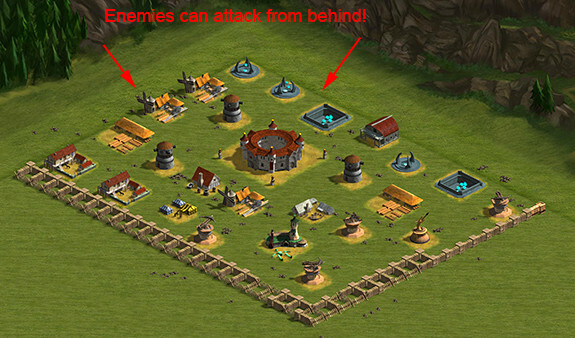 The attacker loses the maximum number only if they deploy their entire War Camps' space worth of units. When the attacker wins Trophies, the defender loses Trophies, and vice versa. The number of Trophies offered to the attacker and defender correspond to their relative success in battle, as measured by the number of Trophies they currently have. You are awarded many more Trophies for defeating a strong rival with a high number of Trophies than you are awarded for defeating a weak rival with few Trophies. The Multiplayer system matches you to rivals who are +/- 1 Castle level from your own. For example, if you are at Castle Level 3, you can be matched against players at Castle Level 2, 3, or 4. (exception: Revenge attacks, when allowed, can be launched regardless of Castle levels). Last edited by bh-dan; 03-05-2015 at 04:00 PM. Start with fast-training, inexpensive units while you learn battle tactics. It only takes a couple of minutes to re-train a large army of Swordsmen. If you are low on Mana, train Burglars! At 25 Mana each, they cost half as much as Swordsmen! However, they are not quite as easy to control in battle, because they always prefer attacking resource buildings. Count the Mana used to train your army and try to attack rivals who will give you at least that much Mana. Otherwise, you may soon find yourself with too little Mana to retrain your army. Beware Catapults! These towers do splash damage, which means they can destroy an entire hoard of light units in one shot! Plan your attack carefully to avoid losing your entire army to a Catapult or two. Hulks are useful against Catapults because they go straight for attacking towers, and can take a few hits before they go down. Battle spells are also great for destroying Catapults. The deadly Catapult! Attack with care. Always try to keep your Makers busy with construction. This panel at lower-right shows how many of your Makers are currently working on a new building or upgrading an existing one. Only 1 out of 2 Makers is busy. The red "1" also indicates that there is another building you can build right now. To get more Makers, upgrade your Maker House by clicking the "+" button. This requires Gold (see "How to get free Gold" below). Always have a full army. 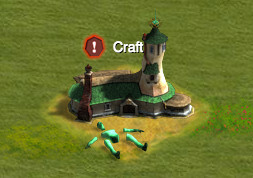 After returning from a battle, immediately start working on replacement troops with your Barracks. If you have more than one Barracks, you can split the training between them to finish it faster. Upgrade as many other buildings as possible before moving to the next Castle level. The Multiplayer system matches you against other players based on your Castle level. As soon as your Castle level goes up, you will face stronger rivals. 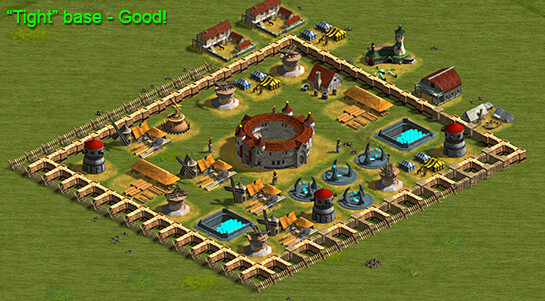 Prepare yourself as well as possible by upgrading Barracks, War Camps, Mana Forges, Sawmills, and all your defensive towers before starting that Castle upgrade. Mana Forges and Sawmills should be upgraded early so that you can enjoy the extra Mana and Wood they produce as soon as possible. Barracks unlock new units as they gain levels. 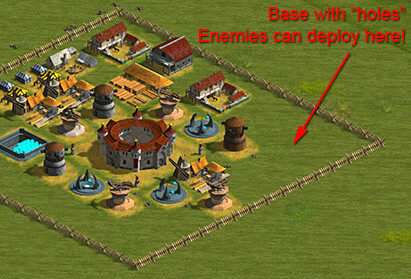 Use two or three Barracks at the same time to re-train your troops faster. The Armory raises your units to higher levels, adding to their health and damage. (beware though, higher-level units have greater training costs, so you may want to delay upgrades until you need them to overcome powerful rivals). 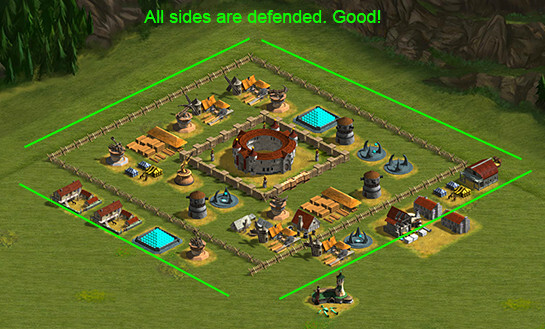 Defend all four sides of your base! Enemy troops can invade from any direction, not just the bottom. This base is wide open to attack from the top! Do not leave "holes" in between your buildings! Enemies can deploy troops anywhere that is more than 1 square away from any of your buildings, even inside your outer wall. Instead, use a "tight" layout with no more than 1 square of space between any buildings. This base has no vulnerable "holes"
To form or join a Clan, build a Clan Hall in your settlement (available at Castle Level 3 and up). Clans gain a private chat channel, and the ability to send troops to fellow Clan members. To ask your Clan for reinforcements, click the "Reinforcements" option on your Clan Hall. You can do this once every 20 minutes. To send reinforcements to your fellow Clan member, watch for their request in Clan chat, then click on "Donate" to provide troops. 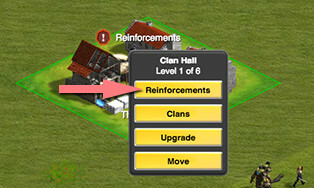 Upgrade your Clan Hall to raise the amount of reinforcement troops you can receive. 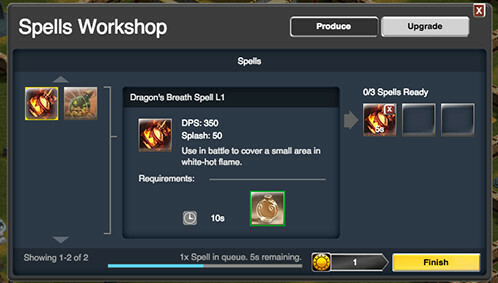 Castle Level 3 unlocks the Spells Workshop, which lets you turn empty Flasks into powerful Battle Spells like Dragon's Breath, which can knock 50%+ health off a tower in a single hit. The only way to get Flasks is by receiving them as a gift from a Clanmate or Facebook friend. 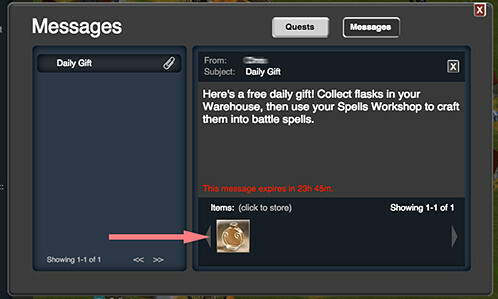 To send Flasks, click any friend on your friend bar and choose "Send Gifts". Or, if you're in a Clan, click the "C" button at the top of the screen to open the Your Clan dialog, click "Manage" on any Clanmate, and then "Send Gifts". You can send out Flasks to every friend and Clanmate once per 24 hours. 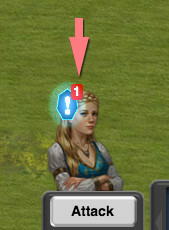 Flasks your friends send you will appear in your Messages menu (click Allandra's picture at lower-left to open the Quests menu, then click Messages). Flasks must be stored in the Warehouse to craft them into spells. Then click the Spells Workshop to turn it into a battle spell! Last edited by bh-dan; 03-18-2015 at 05:22 AM. Click all the Gold Chests you can find in your settlement (usually around the edges). New chests appear every few hours. There are several Quests that award Gold. Check your Quest Bar (at left of screen) to see which quests are available to you. Summon Your Allies (350 Gold) - This quest requires you to gather three Runestones. There are two ways to get more Runestones: invite your Facebook friends to send you one, or buy one in the Store. To get a Runestone from a friend, they must play Summoner's Gate and successfully defeat "The Hammers" - Rall's fifth settlement on the Attack->Single Player menu. Defeating "The Hammers" gives your friend a giftable Runestone item which they can Activate to pass it on to you. Last edited by bh-dan; 10-13-2015 at 06:55 PM.